"At first I thought it was an alien, and I was somewhat frightened," Desmond Phillips says of bizarre-looking catch, which lured dozens to the beach. The massive sunfish was so bizarre looking that Desmond Phillips, one of two Jamaican fishermen who caught the estimated 900-pound behemoth on Sunday, thought it was from another world. “At first I thought it was an alien, and I was somewhat frightened,” Phillips told the Jamaica Gleaner. “It was difficult to bring the fish to the surface, and even more challenging to get the monster into the boat. The two fishermen hooked the sunfish off Boston Bay and after a battle that lasted nearly two hours, Capt. Grant was determined not to let the unusual catch get away. However, they were aboard a small boat and getting the enormous fish to shore proved to be more difficult than reeling it in. They decided to tie it to the boat and motor to shore, but the boat could hardly progress because of the weight of the fish. Sunfish range throughout the world’s oceans, but they are not commonly encountered in Jamaican waters. And they’re quite the sight, roundish and blob-like, with truncated bodies, huge faces, and tiny mouths. 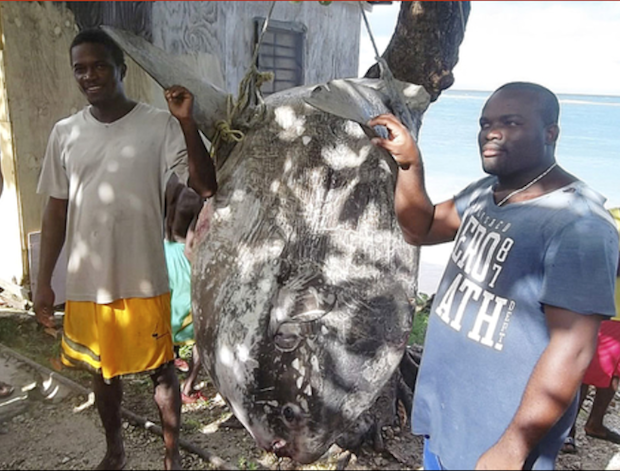 According to the Gleaner, word quickly spread of an “alien-fish” having been captured, and that lured dozens of curious people to the beach at Bryans Bay. Many would eventually learn that these ocean sunfish, or Mola molas, can reach weights of 5,000 pounds, but are harmless omnivores that feed on sea jellies and other invertebrates.